Also, I have just arranged for a new e-mail address to be used for prayer petitions to the prayer circle. Apparently, the old e-mail address was constantly receiving junk mail and would often block prayer requests from being received by our prayer circle. If you have tried to get e-mails and prayer requests sent back or you didnt notice them posted to the site, I apologize. St. Jude has surely heard your prayers, even if I was not able to make the petition for you. The new e-mail address has been updated on the site at multiple places, but if there is a place that we missed please let us know. If you have a petition you wish to present to St. Jude, please leave your name and your petition and we will pray along with you to St. Jude. All e-mail addresses and petitions will be kept confidential unless you wish otherwise. If you wish that your petitions be posted on the webpage, please mark yes or no next to the PS. God Bless. To Saint Jude, Holy Saint Jude, Apostle and Martyr, great in virtue and rich in miracles, near kinsman of Jesus Christ, faithful intercessor of all who invoke your special patronage in time of need. To you I have recourse from the depths of my heart and humbly beg to whom God has given such great power to come to my assistance. Help me in my present and urgent petition, in return I promise to make your name known and cause you to be invoked. 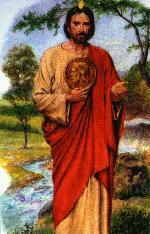 Saint Jude pray for us and all who invoke your aid. Amen. Please pray for Ricka, her grandfather's soul, and her sister. Her grandfather has died of cancers in the body, and she is deeply affected by it. Plus the sadness of her sister...whose best friend was killed in a car accident. Please pray for them. Please pray for Patty, who needs the intercession of St. Jude patron of impossible causes, to find financial help. Please pray for Romulo A. Villanueva, who is experiencing heavy financial burden. And please pray for the soul of his departed father who died on July 26 of this year of 1999. God bless you; and pray with fervor for your father and for deliverance from financial burden.